Born from the purest, combined love of fashion, art, and culture and making jewelry throughout her life, Sara Horne was bound for a creative career. Having experienced a passionate past toward all aspects of the creative arts, studying painting in college, and working retail, it was clear that jewelry was a far bigger part of Sara’s lifestyle than simply that of a hobbyist. 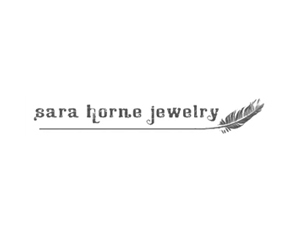 Sara Horne Jewelry’s success began taking off in Lake Tahoe, California post college and continues to thrive out of its home base of Los Angeles, California today. Taking great pride in bangles, baubles, and specialty pieces made from a dynamic supply of natural elements such as stone, metals, and bone, Sara’s bohemian, urban-gypsy glam has all sorts of celebrity fans who await her new collections. As a designer who often utilizes leather, she appreciates its soft, wearable, worn quality and working with materials derived from Mother Nature. Sara’s pieces exude the common theme to which each take on mind of their own and uniquely transform to a wearer’s lifestyle. Versatility is also an important quality of the line, where one can easily accessorize a white tank and jean shorts or mod mini dress with boots. With every collection Sara incorporates new styles, textures, and experiences translated from travels. Endlessly inspired by Southern California’s beachy vibe and surrounding mountainous terrain, day to night…young to old, Sara Horne Jewelry has an adventurous spirit for everyone.